Since 1789, when George Washington became the first president of the United States, forty-three men have held the nation's highest office. Four were killed by assassins,and serious attempts were made on the lives of eight others.Add to that list Martin Luther King, Jr. and Malcolm X,and it is reasonable to conclude that political prominence in the U.S. entails grave risks. 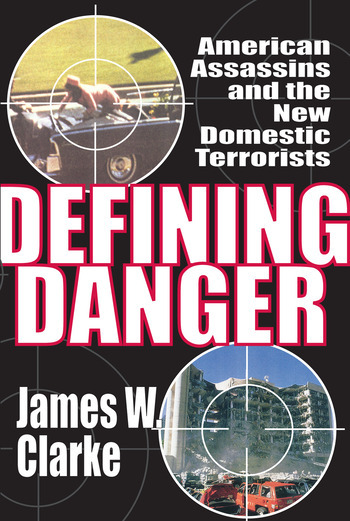 In Defining Danger, James W. Clarke explores the cultural and psychological linkages that define assassinations and a new era of domestic terrorism in America. Clarke notes an upsurge in political violence beginning with the assassination of John F. Kennedy in 1963. Since then, there have been ten assassination attempts on nationally prominent political leaders. That is two more than the eight recorded in the previous 174 years of the nation's presidential history. New elements of domestic terror in American life were introduced in the 1990s by Timothy McVeigh, the "Oklahoma City Bomber," Ted Kaczynski, the "Unabomber," and Eric Rudolph, the abortion clinic bomber. These men were politically motivated; their crimes were unprecedented. These events and the perpetrators behind them are among the subjects of this book. Defining Danger conveys two central themes. The first is that individual acts of violence directed toward America's democratically elected leaders represent a defining element of American politics. The second addresses how danger is defined, through an analysis of the motives and characteristics of twenty-one perpetrators responsible for these acts of political violence where shots were fired, or bombs detonated, and in most instances, victims died. The book is written in an accessible and engaging style that will appeal to the informed general reader, as well as to professionals in a variety of fields—especially in the wake of recent events and the specter of future violence that, sadly, haunts us all.